M13, the globular cluster in Hercules, is one of the finest globular clusters in the sky. It consists of over 100,000 stars and is 25,100 light years from Earth. 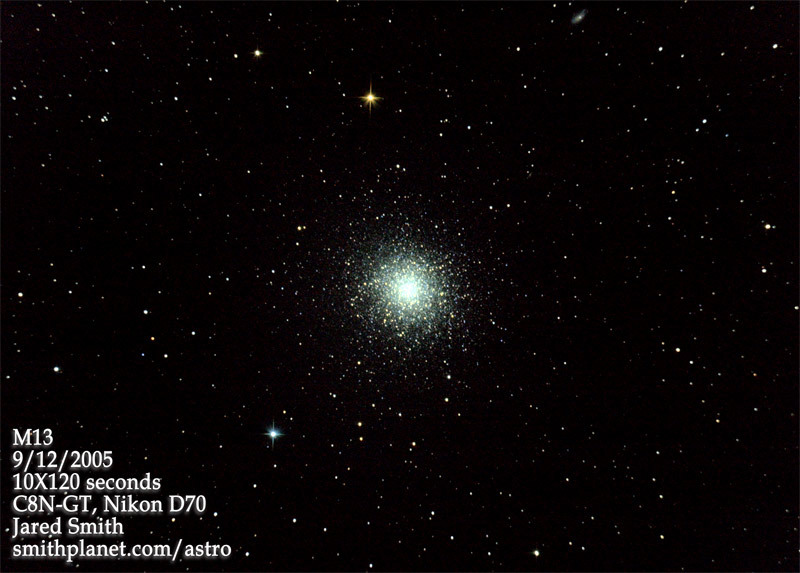 This photo is my first real DSO image at prime focus. It is a combination of 10 2-minute exposures. 2 minutes was pushing the limits of my unguided scope and I threw out another 10 exposures because of tracking problems. There is also noticeable coma near the edges. But overall, I feel like it is a fine image for my first try. You can also see the galaxy NGC 6207 along the top edge.